Crocheters will satisfy their hunger for unique small projects with former Crochet Today editor Brett Bara's Clever Crocheted Accessories. Brett collected 25 delightful, practical pieces that make perfect gifts--though you may be tempted to keep them all to yourself! The ideal curator, Brett shares a first-rate lineup of projects. 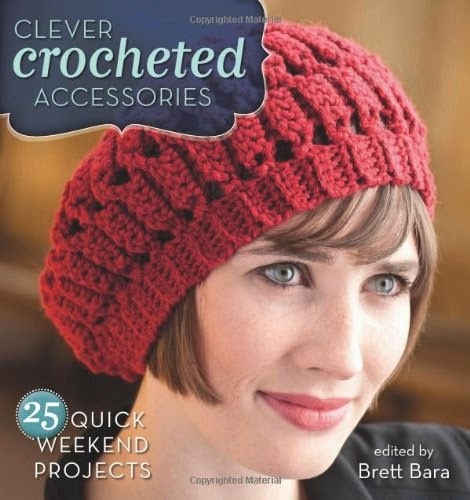 Whether you are a beginner or experienced crocheter, there is something for everyone: hats and caps, including a cloche, porkpie hat, and tam; scarves, shawls, and cowls, from chunky to drapey to snug; eye-catching mittens and arm warmers; delicate lace socks and cozy man-slippers; flirty bags; and sparkly jewelry. Each piece is designed with standout details so that even the simplest pattern has that "wow" factor by showcasing lust-worthy yarn, an unexpected technique, or a fun embellishment. Techniques you'll discover include Tunisian crochet, broomstick lace, and Bruges lace. The all-star roster of designers includes Robyn Chachula, Doris Chan, Mari Lynn Patrick, Regina Gonzalez, Drew Emborsky, Linda Permann, Kristin Omdahl, Ellen Gormley, Cal Patch, Pamela Wynne, Linda Cyr, and Vickie Howell.